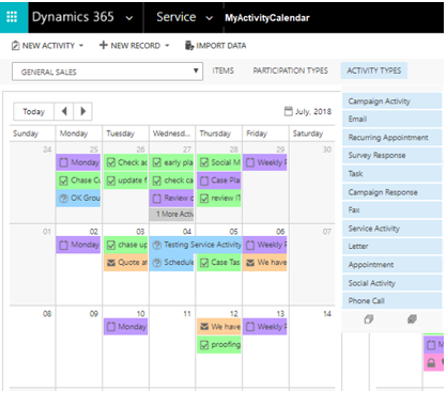 MyCRM Blog | MyACTIVITYCalendar Blog 4 - Customise your CRM with Configurable Calendars for Microsoft Dynamics 365! In this 4th blog, I thought it would be good to highlight another aspect of MyACTIVITYCalendar that makes this such a user friendly enhancement to help boost productivity in Dynamics 365. When it comes to viewing activities, it is extremely important to provide end users with capabilities to be able to select only what they feel is relevant to what they want to see on a calendar. So, in addition to being able to select either User based or Entity Based activity calendars, it is equally as important to ensure that Items, Participation and Activity Types are available to be selected. In the instance of Calendars that show user activities, Items relates to the user/s who own the activity. In the instance where the calendar relates to an entity, items relates to the Dynamics entity record that the activity relates to. Below left we can see how the OPPORTUNITY ACTIVITY calendar that shows a list of Opportunities. This will show all activities that are associated through regarding to Open Opportunities, irrespective of who owns the opportunity record. 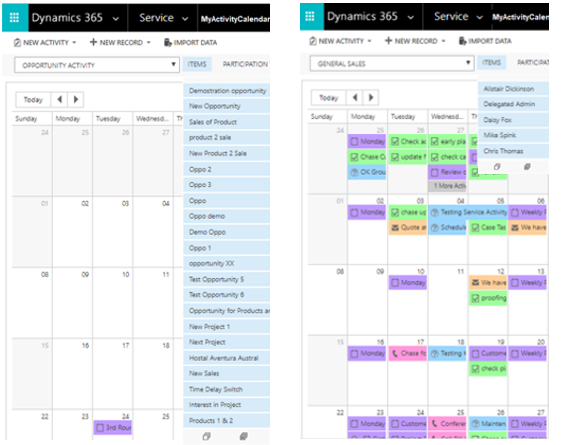 Above on the right we can see the GENERAL SALES calendar which shows a list of Dynamics 365 users. This calendar allows us to select all users or any specific user or users to reflect a view of their activities in the calendar view. Participation types allows the calendar to be configured to include the appropriate Field Values that relate to the activity type in question. For User or Entity based calendar views, this means that during the configuration the calendar can either show or hide all the participation types that apply to an activity. As shown below the list includes everything that can be recorded against all activity types. Whilst relevant information like Owner, Sender, To Recipient and Regarding are most commonly recorded, MyACTIVITYCalendar allows for anything that has been recorded to be shown on the calendar view. In many instances where a user is organising activities for another user or team, it is beneficial to show the organiser’s activities. By doing this, users of this calendar view could select only the organiser from the list, to gain an appreciation of the number of activities that have been organised on behalf of other users. As the name suggest this is all about configuring what types of activities are available to be selected in the calendar view. Users are able to select those that they want to focus on if all activities are shown in the list as is shown below. Once Activity types are de-selected from the drop down list, only those selected activity types will be shown on the resulting calendar view. If it is considered that a Calendar view only needs to provide a more limited number of activity types, it is easy to achieve this during the configuration stage. Seen below is part of the configuration page which allows a Dynamics 365 Systems Administrator or Super User to change the default value for an activity type from ‘Show’ to ‘Hidden’ status. Once this is completed the resulting calendar is saved and will then display a list of values according to the setting applied. Below we can see that the calendar view for TEAM APPOINTMENTS & TASKS only shows the four activity types that were set to show during the above calendar configuration stage. User Adoption is No 1. The flexibility to provide configurable calendar views in MyACTIVITYCalendar is vital to ensuring that the appropriate calendars are built to satisfy the needs of the end users. As is the case with all things Dynamics 365, user adoption is of paramount importance. 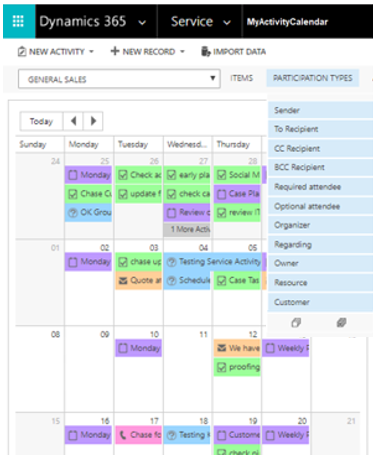 Individuals and teams can be provided with calendars that are simple to use and yet can show an enormous level of detail if required, covering all aspects of a Dynamics 365 activities across the entire business operation. To fully appreciate just how easy it is to build and configure calendar views, I’d recommend viewing a short video that demonstrates the process from start to finish. In the final blog tomorrow, I’ll be highlighting the great ‘drag and drop’ function and some additional calendar views which can be achieved to provide further valuable insight into what’s happening in Dynamics 365, helping to improve an overall awareness and to boost productivity. Keep an eye out for our final blog tomorrow!